As mobile applications are becoming more and more popular, tons of apps are flooding the market everyday. These apps are not only developed by billion dollar companies, but also by individuals like us. You no longer need heavy investment of money and time, neither do you need any programming skills to develop an Android app. All you require is an internet connection & some advice! But remember, this article is NOT gonna teach you how to make the next Instagram, Flipboard or Candy Crush! Nope. But it can help you create and distribute simple apps based on existing web content – An app for you college’s fest, your video channel, a website, basic mobile games and much more without spending a buck and learning any coding language. Ever wanted to have your own Android app? We’ll show you how! Quite a few websites allow you to create your own applications. One the most popular & efficient one, is AppsGeyser. It is incredibly easy to use and has generated more than 5,00,000 applications! Moreover, it allows you to distribute your apps for free & provides monetization as well. First, you must log on to the AppGeyser website and click the green ‘Create Now!” button. 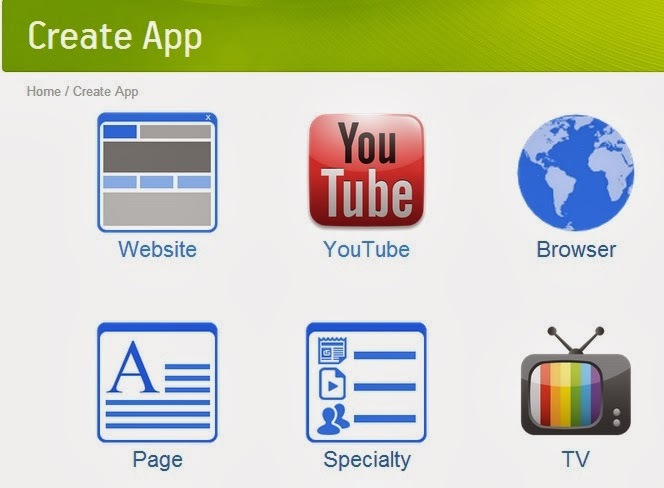 A list of various app templates to choose from would be displayed. Each template has a distinct function, and a layout to facilitate that function. You can create basic applications from websites, html code, YouTube channel, documents, etc. There are 30 different layouts available. If your app requires more than one function, don’t worry, you will later be able to add these as tabs. Next you need to add in the source, which depends on the type of app you are creating. For example, if you are converting a website to an app you need to add the URL. Similarly, if you wanna add your own page you may attach the doc; if a photo app then images & so on. You can see the finished product simultaneously on the “Preview” pane situated on the right side of the screen. Also, fill in other basic details like app name, version, icon, category, app background etc. Once done, click ‘Create App’. Next, fill in your details & create an account on AppsGeyser which would redirect you to your dashboard. Here, you can tweak your app further by clicking ‘Edit’ on the menu above. You may tune up your advanced settings such as App Permissions, Thumbnails, Loading Screen and a host of other settings. If you want to add more content to your app, go to “Tabs’ section, click on “Add Tab” & select ‘more options’ to see the complete list of features to choose from. You can add a Homepage to your app, which would stack all your Tabs in a beautiful shelf-like layout. Download the APK file and check it for yourself. Once you are satisfied with you application you may wanna share it with the world or use it yourself. You can share the download link for anyone to download the appe. You may also wanna browse the ‘Distribute’ section for further sharing options. AppsGeyser also lets you earn through your apps. If your app gets downloaded 100 times (No ads will be displayed otherwise), Click on ‘Monetization’ from top menu and opt in for a Revenue Program. Half of the profits will be shared by you (50-50)! Thats it! This whole procedure should take you less than 5 minutes & without any technical knowledge you successfully created an app, on your own! So go ahead & create apps – show off, flaunt, share, learn & earn!